The unit began life as the Seventy-seventh Special Operations Group (SOG), an elite anti-terrorist unit in the Star League's Special Armed Services. The Seventy-seventh SOG recruited only from the Terran Hegemony and operated primarily in the Taurian Concordat. There they gained a reputation for brutally rooting out terrorist cells. Regular army soldiers who knew of their operations called them the Blackhearts because of the calling card they left on the bodies of their victims. Their unofficial motto was "in hoc signo vinces", or "by this sign you will conquer." Lisa Buhallin, who would go on to become the first Loremaster of Clan Jade Falcon, was a member of the Blackhearts during the Amaris Civil War. After the Exodus the Blackhearts operated as mercenaries in the Periphery until 2866 when they were hired by Archon Elizabeth Steiner. In 3028, Lyran Intelligence uncovered evidence of the Blackhearts' origins. Colonel Sandra Johnson confirmed these reports and was rewarded with a position in Operation Gotterdammerung. Jumping off from Ridderkerk, they landed on Basiliano with the Twenty-fourth and Twenty-fifth Arcturan Guards. There the Night Stalkers outmaneuvered them for three weeks, until caught in a pincer between the two Lightning Companies from the Arcturan Guards regiments. 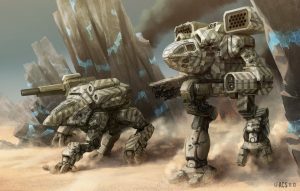 The Blackhearts and the heavier 'Mech elements of the Twenty-fourth encircled the Night Stalkers, and their heavier 'Mechs destroyed a company of 'Mechs, which bought time for the rest of the Night Stalkers to escape. Following Basiliano, the Blackhearts successfully invaded Kufstein. In June of 3029, the Blackhearts landed on Engadin to reinforce the 26th Lyran Guards. While the Twenty-Sixth Lyran Guards fought the St. Cyr Heavy Assault Group, the Blackhearts seized the cliffs overlooking the capital city. Setting up an artillery barrage, they circled down into the 5th Sun Zhang Academy Cadre, who were forced to surrender. In November of 3068, the Blackhearts deployed on Wasat for training exercises. DropShips carrying Raymond's Armored Cavalry and the HeavyHell Raisers landed in the planetary capital of Wasat Prime. Duke Howard Long, the governor of Wasat, summoned Colonel Marcus Johnson to an urgent meeting. At the meeting, also attended by a Word of Blake Demi-Precentor, the Blackhearts were instructed to stand down or Raymond's ACR and the HeavyHell Raisers would be forced to attack them. Colonel Johnson refused, stating that the Blackhearts' contract with the LCCC did not allow the Governor or Blakists to alter their orders. An argument ensued, during which both Colonel Johnson and the Blakist were killed, but not before Johnson was able to relay the wiretapped conversation to his XO, Major Glen Stryker, who enacted Operation BLACK FURY: an emergency protocol in case of betrayal by an employer. While chasing the Blackhearts through the Caledon Valley, Raymond's ACR was ambushed by the Blackhearts and effectively destroyed. The HeavyHell Raisers were battered, reduced to less than forty percent of normal strength, and retreated to Wasat Prime to await reinforcements. In early 3069, the 3rd Division (Word of Blake) (Pure Thoughts and Actions IV-Mu) arrived. For the next two years the Blackhearts waged a guerrilla war against the Blakist forces. The commander of the Third Division, Precentor David Fellers, became frustrated and paranoid at his inability to defeat the Blackhearts, and issued them an ultimatum in January 3071: Surrender unconditionally or Wasat Prime would be destroyed by nuclear weapons. Major Stryker, unwilling to doom his command, chose to evacuate the planet via its hidden DropShips, commandeering a Blakist JumpShip. Enraged, Fellers obliterated Wasat Prime after the Blackhearts had left. The Blackhearts laid low for several years, eventually relocating to Zion, where they spent eight years rebuilding in that world's wilderness. During that time they infiltrated various levels of local government to collect intelligence, while also recruiting and training special forces operatives from the local populace. These formed insurgent groups that could operate independently against the Blakist forces. Colonel Stryker then began operations to destroy the Blakist administration and disable local defenses. So well entrenched and trained was the insurgency that it took just two months for Zion to be liberated, with no mercy shown to any Blakist personnel or sympathisers - those caught were summarily executed. After Zion's liberation, Colonel Stryker confirmed that he still considers his contract with the Free Worlds League to be valid and plans to link up with Duchess Alys Rousset-Marik's command. By the time of Operation SCYTHE, one year later, the Blackhearts are not included in General Rousset-Marik's operational group, so their final destination is unknown. The unit is trained in a variety of tactics, ranging from small-unit to full regiment operations. They excel at night-time operations. The unit is fully self sufficient and owns enough transport assets for the entire unit (three Overlords, two Fortresses, two Seekers, a Vengeance and two upgraded Triumph-class DropShips prior to the Jihad). - During the attack on Basiliano the Blackhearts' 'Mech contingent consisted of one light 'Mech company, four medium 'Mech companies and four heavy 'Mech companies. - Composed primarily of light 'Mechs and serves as a screen/recon force. - Uses heavy and assault 'Mechs. Fourteenth ACS: - Fast hover and tracked vehicles for cavalry tactics. Fifty-sixth Artillery: - The unit contains Long Toms and other artillery pieces. Seventy-seventh: - The unit is the special operation force supported by hovercraft and VTOLs. - The fighters provide excellent close air support, and are organized in its classic SLDF scheme, with 54 fighters in 9 squadrons. ↑ 5.0 5.1 NAIS The Fourth Succession War Military Atlas Volume 1, p. 47, "Basiliano"
↑ 13.0 13.1 Jihad Hot Spots: Terra, p. 45, "Zion Freed"